Could there be a better way to spend a late fall Sunday afternoon than tasting your way through 14 lovely homemade apple pies? This year’s apple pie contest on Sunday, October 28 more than delivered on its fragrant promise of tart fruit filling and flaky crust. As one of four judges, I had the taxing job of deciding which pies were the best. While it’s true that pie tasting isn’t a really tough task, in practice it turned out to be more difficult than you might think. 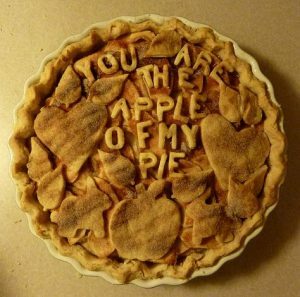 Apple pie is a pretty simple dish with few ingredients, so it was fascinating that each pie had a unique taste and texture; and parsing everyone’s pie components– and comparing them to several others– was a bit tricky. Personal preference also played a part: do you like your pie apples thinly sliced or chunky? And which varieties of apples? 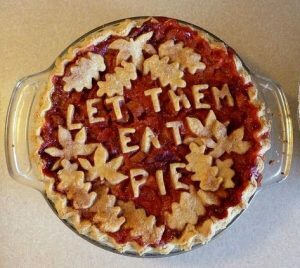 Should the liquid in the pie be runny or thickened? Which spices are best, and how much? What about other additions, like lemon juice? Crust made with shortening, lard, butter, or any combination thereof? Multiply all these factors by fourteen pies and four tasters and you have a recipe for complexity! Nonetheless we bravely persevered and were, perhaps surprisingly, united in our eventual rankings. In general, the judges preferred a pie filling with assertive apple flavor and a bit of spice. Though variety may be the spice of life, in an apple pie the traditional duo of cinnamon and nutmeg always seemed to work the best. Lemon juice is a traditional flavor brightener for pies; we appreciated this as long as its presence didn’t dominate. 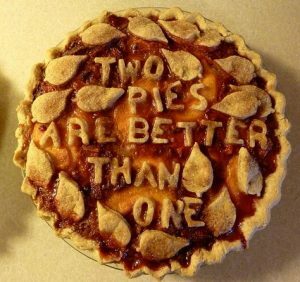 Though we didn’t want a runny pie, we also downgraded pies with too much thickener, or those whose thickener had a detectable taste. Almost all the pies had excellent apple flavor, which you might expect in an area that grows a bounty of apple varieties. However some fillings had apparently been overbaked (or the apples weren’t good bakers) and were mushy; we preferred a pie where the apples were definitely cooked but still had some chew to them. Moving on to the anxiety-inducing crust, we looked for tenderness, flakiness, and a complementary flavor to the apples. We downgraded crusts that had a pasty quality, were under- or over-salted, or were too thick. One of the holy grails of pie baking is a crisp, well-cooked bottom crust, but alas– none of the pies really achieved this admittedly difficult feat. We did admire many beautiful, golden top crusts; and some pies gilded the lily with coarse sugar sprinkles and/or pastry cutouts. Beyond good looks, the tastiest crusts tended to be those that were at least partially made with butter. It’s hard to beat butter’s distinct and delicious flavor! 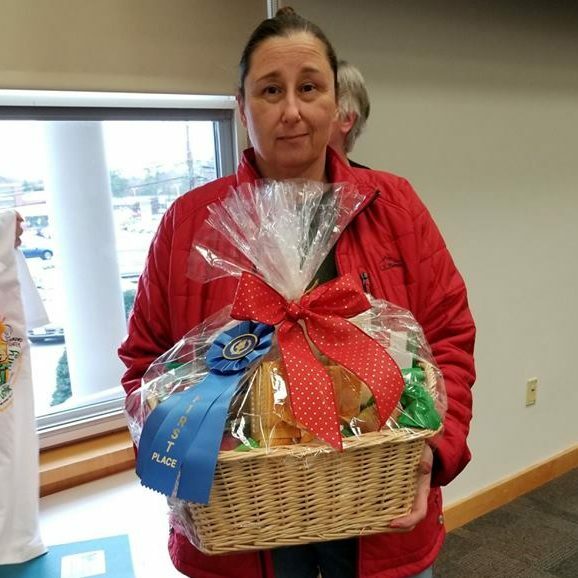 After an hour of tasting, discussing, re-tasting, and a bit of give-and-take, we judges had our winners: first prize went to Tina Starner; second prize to Tony Blank; and third to Pat Enwright. Pat also had the distinction of winning the People’s Choice award! Thank you to all the contestants who took the time and effort to make a pie from scratch. Thanks to the Friends of the Library for sponsoring this enjoyable annual event. So start practicing! Next year’s contest will be here before you know it. Love pie? Want to learn more about all aspects of creating this iconic American dessert? Check out these titles at the Chelmsford Public Library, and happy baking!